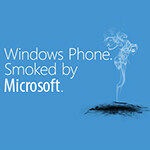 Smoked by Windows started life as a clever series of challenges at CES this year. The demo guy, wielding a practiced hand on his WP7 device, was betting a hundred dollars that volunteers couldn't match his phone at common tasks. He lost a few times, but he won the majority of the time and Windows Phone came out looking aggressive, hip, and most of all fast. Microsoft generate a lot of free publicity at the even (minus a couple hundred dollar bills), so it wasn't surprising when the event morphed into an advertising campaign. Then, to crown it all off, Microsoft decided unveiled in-store challenges that placed a $1,000 laptop on the line. And that's where Microsoft may have tried too hard. We understand that with stakes of this magnitude Microsoft doesn't want to lose, so we expect them to stack the deck in their favor. Still, as long as they were showing off the some of the world-beating features of Windows Phone, who could blame them? Alas, new information has come forth that casts the in-store version of the challenge in a less favorable light. Earlier today we reported on a small brouhaha that arose when Sahas Kattaa beat the “Smoked by Windows” challenge with his Galaxy Nexus. An employee at his local Microsoft store challenged Katta to see who could more quickly display the temperature in two different cities. Mr. Katta had two weather widgets already configured to do so, and had further turned off the lock-screen, allowing him to win the challenge with the push of his power button. The store employees, apparently caught off guard, claimed his victory “didn’t count” because the two temperatures had to come from different states, even though that wasn't a previously stated part of the challenge. As you'd expect in this day and age, the interwebs erupted with people calling Microsoft out, and someone with a higher pay grade soon made the executive decision that looking like a poor sport was worse than admitting the loss and providing Katta with his $1,000 laptop. We commend Microsoft for stepping up and doing the right thing here, but we wonder why this issue wasn't anticipated - surely they knew that such a loss would happen eventually? It turns out that Microsoft may not have been prepared to lose; they had constructed the challenge in such a way that employees with the proper training could avoid losing altogether. They circulated a training guide with detailed instructions on how to conduct the challenges - a guide that fell into the hands of writers at The Verge. Given the steep price and high embarrassment of a loss, it’s not really surprising that Microsoft would have guidelines on how to conduct the Smoked by Windows challenge. What may surprise you, however, is how bluntly the guide admits that Windows can be smoked by other phones, and how it teaches their employees to "select a challenge appropriate to your customer" so they won’t lose. The weather challenge, for example, is not recommended for use against Android devices. The guide warns explicitly that “Android users have access to Widgets that can, if properly configured, display the weather and other information in real time.” Apparently they should have spent more time on that aspect of the training. Owners of Apple’s iPhone, on the other hand, do not have access to homepage widgets and as such are perfect candidates for the weather challenge. didn’t count” because the two temperatures gad to come from different........ I believe the word you were looking for is had. Backfired.... it was bound to happen, even when its staged... fandroid and ifans should set up their devices for all possible challenges and score a laptop or two for their teams. also I knew this was meant for them to call attention of costumers, so its well staged. MS is selling an eye to make WP popular again, Having their CEO Stephen Elop talk bad about android in every possible way and claim WP was a OS of equal opportunity to attract manufacturers Having an upper hand to create a buzz is so much like MS. so I wont get mad if you happen to set you phone up tl counter every challenge. you could go in with a few phones and almost certainly get a laptop. maybe just a high end android and an iphone would cover it. Haha I read this on another site, so f'ing funny. Its even more sad it was a Galaxy Nexus. They didn't get beat by just any Android phone, they got smoked by Thee Android phone of them all. Ha! The next challenge is, "How fast can an Android phone vs. a Windows phone change their background?" Zing! how did the guy cheat exactly? by looking at the competition before entering and setting up his phone accordingly? he used tricks that are available in the stock ICS set up. You think the WP7 device isnt set up for quick access and those guys dont spend all day practicing? lolz i think someone is just mad the iphone has yet to win. it's not a test it's a competition. the opponent uses information learned before-hand to gain the upper hand so why couldn't he? Dear phonearena, as I previously said, please do not copy or try to put out some brain in you articles. It's pointles. This is not New York Times, and you are not Larry King, okay? It's hilarious when you post such articles, concerning marketing and etc. I bet that 80% of the people in your team are not even graduated journalists(what you actually should be). Take this piece of advice and take it easy on such matter. Stick to what you do best - showing phones without many comments. Peace. Dear strikercho y u read this article? Oh no you di'n't! First off, Phone Arena is a proper noun. Be sure to capitalize it whenever using it in a sentence. Also, it should be "The New York Times." In addition, you don't have to use a comma before the conjunction "and." In fact, try not to use commas when they aren't needed like when you said, "It's hilarious when you post such articles, concerning marketing and etc." Oh, a big thing about journalism is fact checking. Do you have sources saying that 80% of the people on the Phone Arena (see, proper noun) team don't have journalism degrees? (I won't even comment on the "graduated journalist" part.) Take this advice...don't comment on a site's journalistic merit when you don't grasp even the basics of American English (another proper noun) grammar. Also, Phone Arena never admits to being a hard news source. They post news topics, reviews, and rumors (I used commas because I was creating a list of things). If you are looking for hard news only, Phone Scoop is a great site. The whole time I was reading this comment I couldn't help but picture Ben Stiller from dodge ball, Now let me hit you with some knowledge!!!! wow, virtual high five for that super pimp hand there Jeff.. lolz. i had the exact same image park. ha! I think zoombie planet or lala land? Does it cost you anything to use this site? I didn't think so. Some of us (me included) would like to read this article. consumer wouldn't care about what you just wrote he wants a phone can do many thing in a fast way and smooth as butter. and actually there is no big differences now between phones, they all can do the same, maybe 1or 2 seconds faster or slower. consumers follows the media and the hype! which is why apple is so popular. the only "pc like" OS right now is android. Everything else is full of curated and controlled devices. Some like openness, some like curated. They both exist because people like both. That said, WP7 is not as nearly as controlled as apple, but its no where near as willy nilly as android.. its slightly off centered (in apples favor) between the 2.